Fall Brings Red Peppers and Ajvar, 'Serbian Salsa' Making ajvar, a savory roasted red pepper and eggplant dish, is a ritual tied closely to fall, the peak harvest time for red peppers. Julia Mitric shares a recipe for ajvar, which she learned about from her Serbian grandmother. 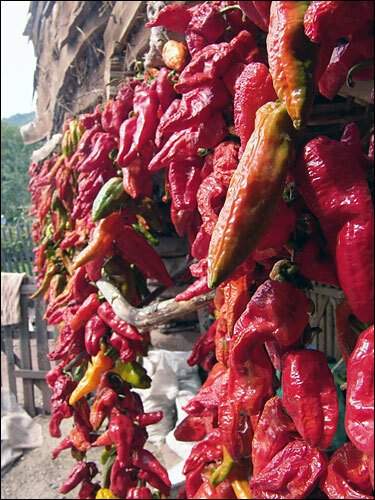 Homes and markets in Serbia overflow with vibrantly colored red peppers during the fall harvest. The peppers are used to make large batches of ajvar, a tangy red-pepper spread that's a wintertime staple. Scroll down for recipe. Julia Mitric is a freelance radio producer living in Sacramento, Calif., with her husband and two hens. She loves to cook and write about food, especially recipes she discovers while traveling. If you stroll the streets of Belgrade this time of year, you'll smell the dusky, smoky fragrance of roasting peppers mingled with the scent of fallen leaves. 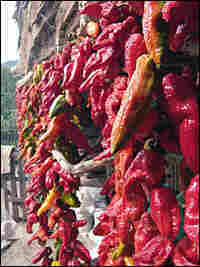 Stalls at neighborhood markets overflow with mounds of peppers, while village vendors lug giant sacks of the red beauties to street corners to tempt passers-by. Making ajvar, a savory roasted red pepper and eggplant dish found across the Balkans, is a ritual tied closely to fall, the peak harvest time for red peppers. Family cooks roast batch after batch of the colorful vegetables, making plenty of ajvar for their winter pantry. The smoky and tangy spread, which also features minced garlic, olive oil and vinegar, can be a bright garnish for a dish of grilled meats, paired with Mediterranean salads for a meze platter, or simply devoured on a piece of crusty bread threaded with olive oil. I first learned about ajvar from my Serbian grandmother, Desanka Mitric, an 88-year-old widow who lives in a small village in northwestern Serbia and believes in the curative powers of homemade food. My family and I visited her every other summer, from when I was a baby until age 16. 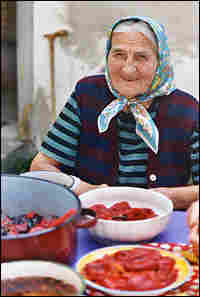 During those trips, I spent hours helping her peel endless mounds of roasted peppers in her kitchen, where ajvar is a part of everyday life. My grandmother couldn't attend my wedding last year, but I knew I wanted to do something that would represent her on the day. I decided to make jars of ajvar. After two frenzied days -- and much help from my mother -- I made enough ajvar for a jar on every table at the reception, a little reminder of my beloved grandmother. Ajvar isn't uncommon in American pantries these days. An array of roasted-pepper concoctions has migrated from the shelves of ethnic food shops to the aisles of mainstream grocery stores such as Trader Joe's and Whole Foods; look near other spreads such as olive tapenade. The flavor of store-brought varieties may range from mildly piquant to quite sweet. 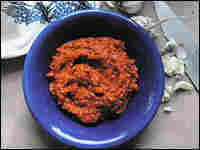 But ajvar's true delight is the marriage of its spicy, garlicky kick with its silky yet slightly chunky texture. My friends affectionately have dubbed it "Serbian salsa." But to get the distinctive taste of authentic ajvar, you must make it from scratch. Luckily, it's simple enough to do in half an hour with some basic ingredients. 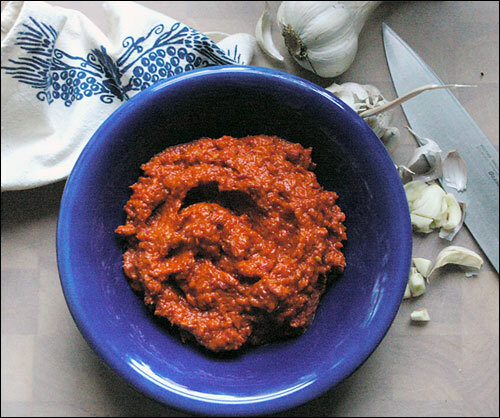 Once you've made an inaugural batch of ajvar, you can tweak the ingredients to your liking. Some recipes omit eggplant altogether. For a different color of ajvar, use a mix of red, yellow and orange peppers. Some cooks add roasted chili peppers to the mix to give the dish a fiery taste. If the bite of raw garlic is too much for you, try mashing the cloves with salt and a squeeze of lemon in a mortar and pestle to take the edge off. I use plain white vinegar for its clean flavor, but red or cider vinegar could work as well. In Serbia, ajvar stars as a starter or as a colorful complement to grilled meats and kabobs. Ajvar also does well alongside sturdy grilled fish like salmon or swordfish. You could toss it with spaghetti, adding olives and parmesan for a quick meal. For a Mediterranean-style meze platter, serve ajvar with a trio of cold salads like hummus, tabbouleh and baba ghanoush. For a more luxe version of ajvar, blend in a few tablespoons of creme fraiche before serving. Ajvar is also fine company on a cheese plate: Try it with brie, camembert or a creamy havarti. Finally, a dab of ajvar gives a bold flavor kick to any sandwich; it's especially great on a grilled panini with prosciutto and mozzarella. Read last week's Kitchen Window. The key to this recipe is not to be shy about blackening the skins of the peppers. Underneath the blackened skins, the peppers become tender and silky -- that's the secret to ajvar's distinctive texture. Use an ice-cream scoop to remove the pulp of the eggplant, leaving the skin behind. Discard the thickest seeds, but don't get nit-picky. Put eggplant in a food processor with about 2 tablespoons olive oil and 3 or 4 smashed garlic cloves. Pulse the eggplant a few times so that it's chopped with the other ingredients but not totally pureed. Remove the eggplant to a serving bowl. Once peppers are cool enough to handle, peel them with your fingers or a knife. Add peppers to the food processor and pulse 5 to 8 times to chop coarsely. Mix the peppers with the eggplant puree, season to taste with salt, pepper, a splash of vinegar and a shake of dried chili flakes, if you like. Smooth the surface of the ajvar with a spatula. If you wish, garnish it with more finely diced garlic and a few scattered basil leaves. Serve ajvar with toasted bread slices drizzled with olive oil and sprinkled with salt.